Here’s the inked version of my pencils. It is amazing what Allen Passalaqua did with colors to make this image spring to life! I did use a real life model for this project and that made a huge difference in the results. Thanks go out to my seven year old buddy Ian Alfaro for being a great subject! Ian posed for both boys and I changed the cosmetic details as I saw fit. 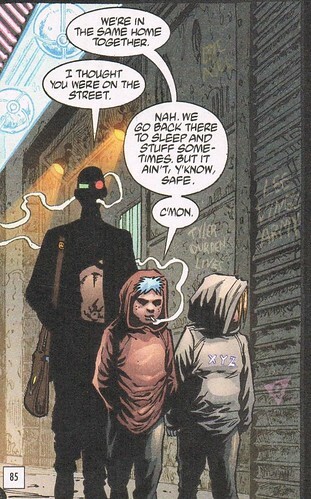 Here’s a panel from Transmetropolitan #40 where Spider encounters Matt and Luke, child prostitutes. Spider finds that some things can shock a person, even his jaded self. This story really moved me the first time I read it and after refreshing myself on all the characters in the book, I kept finding myself coming back to these kids. As anyone who has read my memoir-fantasy Princess Witch Boy knows, I am strongly allied with the stories of children, especially those who have undergone traumatic upbringings. All too often, these stories are kept secret out of shame or guilt. Children are much more intelligent, sensitive and capable than they are given credit. The title of the story is “Business” and starts off with the boys soliciting men as they enter the public restroom. Spider appears and takes the kids aside to find out their story. His time with the boys leads him to an orphanage where things are even worse than he imagined. He also meets a young girl prostitute who is friends with Matt and Luke. I drew her too and will feature her in Part II of this post tomorrow! These are some small preliminary sketches I did for the boys and the girl. They are small, approximately 4 x 5″ and done loosely in ink and then watercolor crayons. They gave me a feel for the poses I was looking for and the overall emotional feeling I wanted to convey. Another concept sketch featured one of the boys alone. I went back and forth trying to decide whether I should illustrate the boys together or separately. I eventually decided that since the comic showed them as a twosome I should do the same. This is the final product as seen in the finished book. I am so proud of this work! It feels miles beyond what I have done before and I think the scope of this project pushed me to the best work to date. Tomorrow we look at the second piece of art I have in Transmetropolitan: All Around the World!